Yet another great shot from Victor of another ex Birmingham Daimler CO5G with the following note. Victor is defiantly correct with his rebodied comment but with the aid of my BBF 14 and Peter Goulds excellent website it would appear the body in the shot above on FOF 251 is its third. 1251 – FOF 251 received a MCCW H30/24R body from 939 – COH 939 in 1948/9. A comment in BBF says against the 919-963 batch ‘Many bodies interchangeable 1948-49’. This comment appears time and time again with different dates against batches of COG5s one has to ask the question did Birmingham have the same system as London Transport had with interchanging RT bodies when the vehicle were being overhauled? After a little more research it gets more interesting and starts to dismiss the interchanging at overhaul theory because 939 was withdrawn in 1949 but what is even more interesting so was 1251, so why interchange the bodies then withdraw them both? …..and that’s a Burlingham coach body. The new body is by Burlingham. Yelloway of Rochdale had a pair of identical ones on Leyland PS2/7 chassis with FC37F layout. They were HDK 801/2 of 1951. This was probably Burlingham’s last attempt at modernising the body design for front engined chassis before the onslaught of the underfloor engine and the introduction of the Seagull. There is a photo of HDK 802 in the book ‘The Yellow Road’ which covers the history of Yelloway from its rise, heyday to the sad decline in the post-deregulation era. But that’s another story. Please see Harper Bros AEC Regal III posting – including comments today (9.12.11) – for the half-cab version of this body. To make life easy here is a quick link. Yet another fascinating subject! If it was withdrawn as a double decker in 1949 (didn’t Birmingham vehicles usually have longer lives?) It’s fair to assume that this body was fitted in that year or 1950. It’s always a source of wonderment to me, not living in those times, that operators did such things, presumably it would have provided a slow and loud ride, but then there were no motorways or by-passes in those days! One thing occurred to me, I know that the COG5 was a fairly common choice for coaching before WW2 but I don’t remember hearing of any examples of CVG5’s as coaches post 1945. Weren’t all Daimler coaches post war of the CVD6 variety? As far as I know, you are correct about CVD6 coaches. Was it the case then that TVD (Daimler) would only supply CV chassis with their own engines when they produced these post war? Gardner only seemed to return later with the various "tin front" CVG6’s, which then seemed to eclipse the Daimler engine & fluid flywheel. Anyone know more? Salford certainly had a fair sized batch of post-war CVG6s (as opposed to CVDs)with exposed radiator and the quadrant-style pre-selector change. With Gardner under pressure to supply several other bus and lorry manufacturers, Daimler sought to relieve this constraint on its output, and increase in house value by offering its own oil engine. The Daimler 8.6 litre engine was developed immediately prior to the outbreak of WW2, prototypes having being constructed in 1936. The destruction of the Radford works in the heavy air raids of 1940 and 1941 put back the production process until 1945. The design emulated the feature used successfully by Dennis (and later by Meadows also) of employing timing gears at the rear of the engine rather than a front mounted timing chain as used by Gardner and others. This resulted in a compact unit, but meant that the engine had to be removed from the chassis to allow access to the timing gears. Had the engine been as outstandingly reliable as the Dennis designs, then this would not have been a problem. Sadly, the CD6 unit soon became noted for its fuel thirst, and a marked variability in quality between individual engines, the best being good, but the worst examples being considered as bad a the Crossley HOE7. London Transport, having had experience of a batch of thirteen(!) 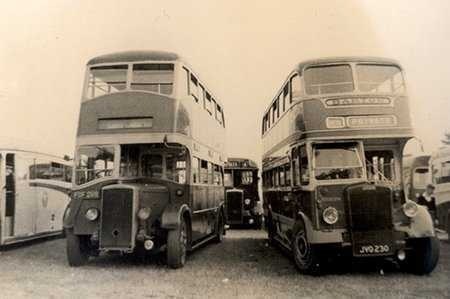 CWD6 buses taken in 1945, refused to take any more Daimler engines, and replaced the thirteen it had with AEC 7.7s in 1950. Like the Crossley, the smooth running CD6 engine seemed best suited to coach work rather than the heavier demands of double deck or stop start stage carriage duties, and most CVD6 chassis were bodied as coaches. There were exceptions, such as the large batch of CVD6 double decks operated by Birmingham. By the mid 1950s, with bus and coach travel beginning to suffer from private car competition, the Daimler engine largely vanished as an option, one of the last examples probably being the turbocharged unit fitted experimentally in a Halifax CV ‘decker in 1964, by which time it was a rarity. Interestingly, the prototype Fleetline had a Daimler engine, and one wonders if the firm ever seriously considered this for production. The Freeline single decker also had a Daimler engine option. Gardner engines continued to be offered in CV chassis throughout the brief reign of the CD6, and, of course, beyond, where they became standard in the Fleetline. Sheffield were never a Daimler operator until the Fleetline effectively replaced the AEC Regent but their only post war Daimlers were CVD6/NCB. There were no further orders for half cab Daimlers. According to Peter Gould’s site it was 1252 and not 1251 which received the body from 939. 1252 then survived until 1954. My (admittedly limited) experience of COG5s suggests that FOF 251 would have been far from noisy. I only had one ride on a Manchester one, but it was every bit as sweet and refined as the CVG5s built more than 15 years later, and in fact with eyes closed the riding experience was identical. Slow it might have been, though, especially as with 37 seats it must presumably have been extended beyond its original length. Prewar COG5-40 coaches had five-speed gearboxes and probably lighter bodywork. 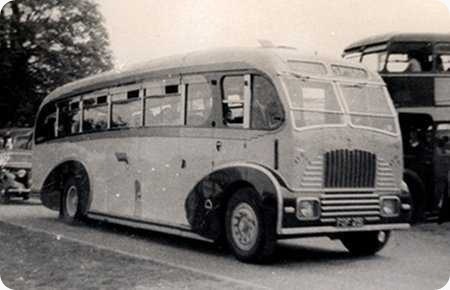 FOF 251 was fitted with an AEC 7.7 engine some time after it received its Burlingham coach body as this would have been a much smoother unit for coaching duties. This was before it joined Spiers tours so in the photo it is, in effect, a COA6! It was scrapped in 1964.